sneakydave wrote: Downloading as I type. Episode 6 of Deer Meadow Radio is waiting for you...don't be late! We finally kill off our discussion of the Twin Peaks Pilot, amble into Richmond for the Great Southern, and cover all the latest TP news. •The Numb Buns of Destiny!!!!! •Could Entenmann's Bakery have saved Twin Peaks (and did the R&R block them??)!!!!!? •Who are Cap Cities and why did they hate Twin Peaks???!!!! Please join us if interested! 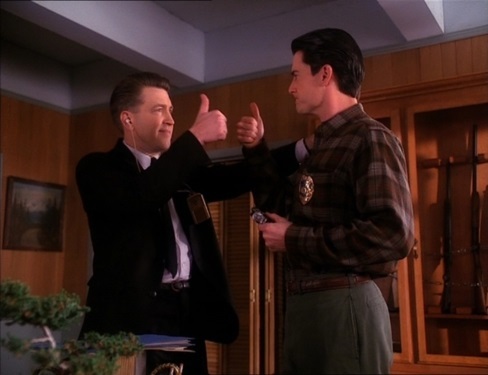 We have managed to eek out our eleventh episode where we continue our discussion with Ken Scherer... this time honing in on the murky origins and possible legacy of the Twin Peaks Access Guide. •Deer Meadow Radio Totally Gets Shatnered!!!!!!! •Who Played Young Harry, Hank, Hawk and Toad?!?!!?! In case you don't have anything else to read/listen to these days, please join us for Episode 12 of Deer Meadow Radio, where we conclude our discussion of the Twin Peaks Access Guide and its murky connections to Mark Frost's Secret History of Twin Peaks. •Find Out Who Discovered Twin Peaks!!!?? •The Hornes Keep Playing With Fire!!!! •Who Dwells in the Mysterious Land of Bloon?!?!!! Follow the link if interested! •A Clue from Mark Frost on the Hazel Drew Murder!!!!!!!!!? •The Further Adventures of Jack Sparks??!!?? •The Young Douglas Milford Chronicles??!!!!??? Great episode. I've actually missed a few so now I've heard this one I'm going back to listen to them too. Great work. I look forward to hearing more from Harley. Every time I've heard/seen him interviewed, he comes across as such a nice guy; always willing and happy to talk about Twin Peaks. It'd be great to meet him one day. Thanks Hopes! Harley Peyton was totally cool and down to earth. Have you checked out Channel Zero? Really good stuff. Part II with Harley will be more on the original show itself and likely out in early December. Next up... The Secret History, of course! Please join us as we begin our discussion of Mark Frost's Secret History of Twin Peaks... plus all the latest news! - Was Hubert Humphrey Screwed Over??? - You Can't Keep A Good Access Guide Down!!! - How To Become A Mason??? Yes... you are correct, sir!